Hey there! How about a nice, light little quaff? Sound good? THEN DELETE THIS EMAIL ASAP, ‘cause this ain’t it! Nope! But it IS 50% OFF!!! Washington State badass-ness! Lush, powerful and a truly screaming deal --- don’t ask how we did it! We don’t see nearly enough of these, and for sure not at a price like this...a must if you dig BIG, velvety, meaty rich red. DARK SIDE INDEED! Dudes, we heard you! The last Darby we offered some months back went so fast, it made our eyes roll back into our heads...so we’ve been relentlessly working to get more. AND HERE IT IS --- a rockin’ forceful, authoritative red (with a soft side) at EVEN LESS than the last vintage! Ah, heck, it’s the holidays, we’re just in a good mood!! 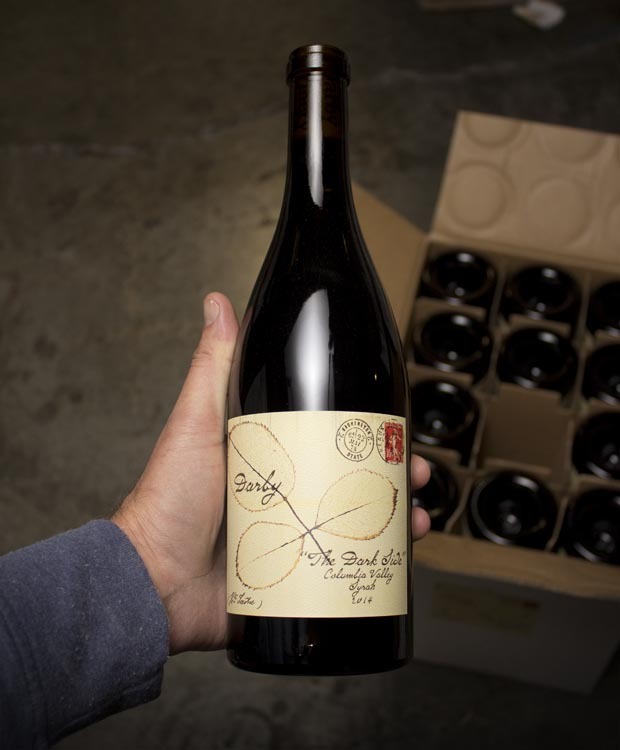 Everyone has a Dark Side and this blend explodes with notes of roasted meat, pepper, licorice and floral blackberry. The texture of this wine is soft and silky with big polished tannins. Crazy good Syrah for the price. It all began in a basement in 2002. Darby, then a passionate wine drinker with more than an appreciation for a good red, decided to make winemaking his purpose. It was at the inception of the Woodinville wine craze. Darby knew something huge was about to happen, and his passion led him to enter the ring. He knew that to become the best, he must use the best. The best grapes, the best techniques, the best timing. Through his fixation on quality, his scientific like approach to excellence in balance, and his rebellious risk-taking to forge something new, Darby quickly became known for crafting some of the best wines in the state. Vegetarian dishes, lamb, soft cheeses. Grilled hanger steak with Chimichurri!